It’s not always easy fitting a new home into an existing development… especially one originating in the 1980’s. 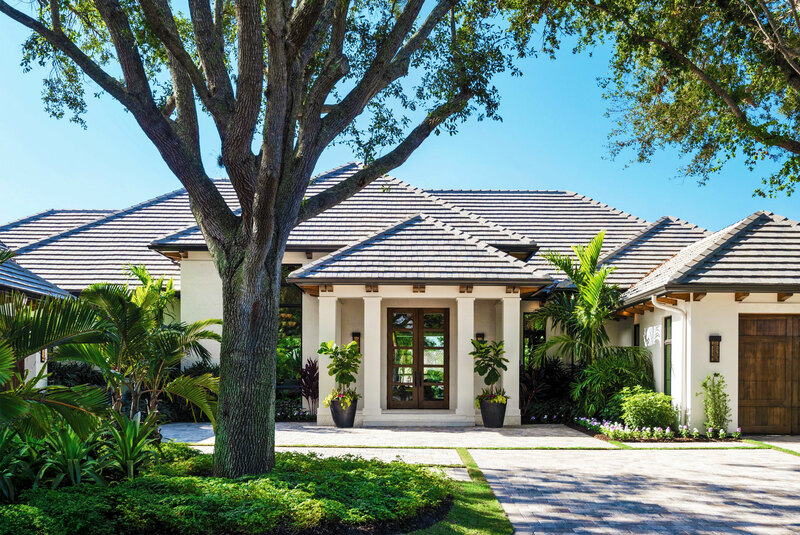 But with dramatic yet transitional lines, architect John Cooney makes this model feel at home in Pelican Bay. Pelican Bay, a sprawling Naples amalgam of single-family homes, condominiums, high-rises, and spectacular beachfront has transitioned from its heyday in the 1980s to become one of today’s most sought-after addresses. And the development company, Calusa Bay, has stepped into the moment with a star-studded team that reads like a Who’s-Who list in the Naples luxury real estate market: developer Leslie Sherman, Calusa Bay Development; architect John Cooney, Stofft Cooney Architects; general contractor Matt Knauf, Knauf Koenig Group; and designer Randi Scott, Calusa Bay Design. “THIS TIMELESS, RUSTIC CONTEMPORARY ARCHITECTURE WILL WITHSTAND THE TEST OF TIME, WHILE INCORPORATING MODERN DAY AMENITIES AND CURRENT LIFESTYLE TRENDS,” ARCHITECT JOHN COONEY SAYS. ABOVE: Sofas clad in Kravet’s pale ivory chenille, EJ Victor’s formidable cocktail cubes and an oversized sofa table of cerused oak from Planum Furniture center the great room, where a folding glass wall opens to include the lanai. Working hand in hand, Cooney and the team decided this 5,100-square-foot Pelican Bay home should be both contemporary and rustic, with soaring rooflines, floor-to-ceiling windows and an open concept interior. “Our design goal is always to stay ahead of the curve, to create timeless and exciting spaces for our clients,” Cooney says. “This home achieved that goal with a fresh eclectic style, reminiscent of a Southern California rustic contemporary bungalow.” Stained cypress corbels and shell stone accents marry perfectly with the home’s more contemporary mahogany and glass double entry doors. ABOVE: Calusa Bay Design’s private label cabinetry in the kitchen and in the butler’s pantry is topped with Classic Stone’s leather-finished quartzite. A center prep station makes it easy to serve family and friends seated in the breakfast area’s custom banquette and Made Goods’ artistic metal chairs that pull up to the in-house designed table. 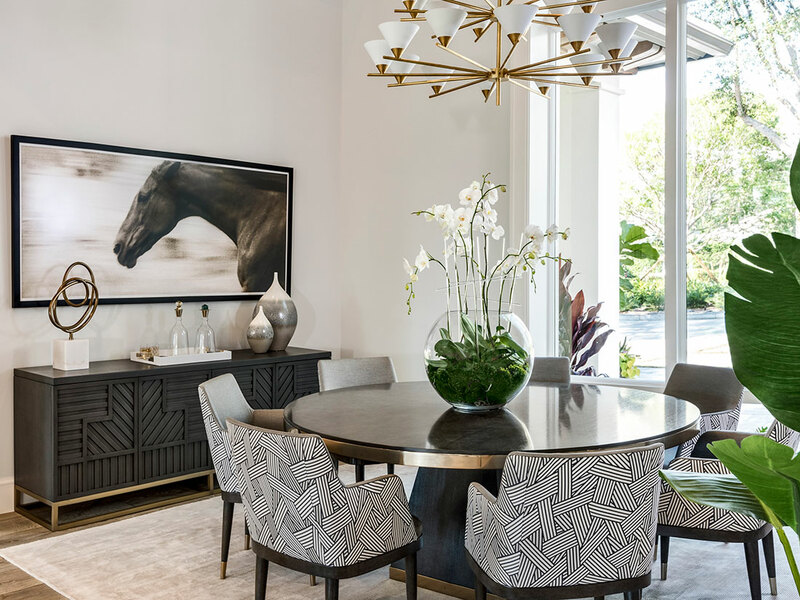 BELOW: The image of an impressive equine at full gait demands attention in the dining room, where Kelly Wearstler’s three-tier “Cleo” chandelier from Visual Comfort shimmers above a slate-finished oak table trimmed in brass. Dining chairs dressed in Dedar’s cross-hatch pattern of entangled ribbons exudes a three-dimensional effect. In the great room, a custom, lighted feature wall perfectly accents the open concept living space. Here, a large wool and silk rug begins the play of textures that will dance throughout the home. A wall of folding glass separating the great room and outdoor living spaces opens graciously to one side, combining the living area and lanai to create a fabulous indoor/ outdoor space. Screens drop down to enclose the lanai and its tile-faced fireplace and open-air dining space. With the kitchen steps from the great room, only a slight shift is needed to draw culinary specialists into any party. A corner banquette — one of Calusa Bay Design’s signature elements — makes breakfast a delight over which to linger. Light abounds in the elegant, double-transom dining room. Kelly Wearstler’s confection of brass and white-glass cone shades suspends from the 18-foot-high ceiling. Calusa Bay Design created the slate-finished linear-cut oak and brass table, and the stylish chairs with their own polished brass ferrules. The geometry of the custom-designed sideboard is repeated in the chair’s Italian fabric. Scott continues the monochrome palette in the master suite, where architectural form and function combine to create a sense of elegance. 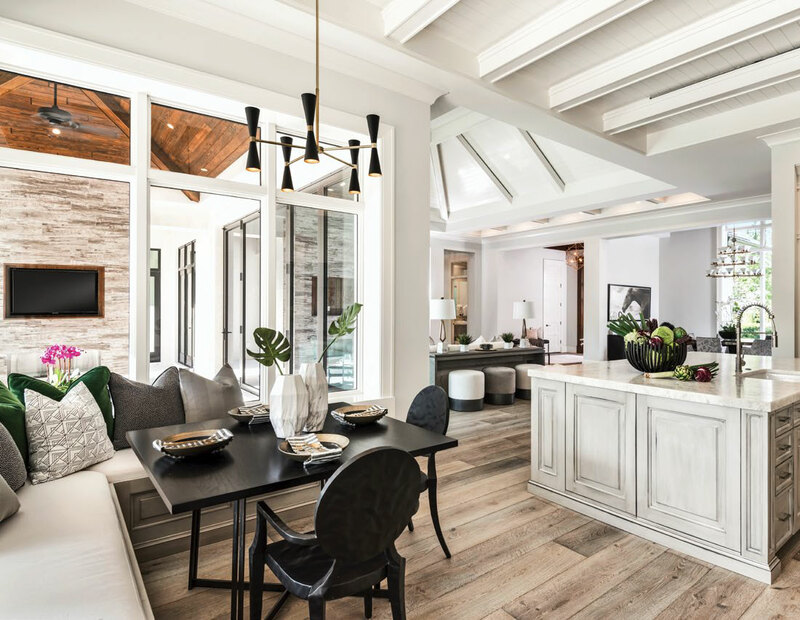 The vaulted beams of the ceiling cache ventilation design, while transom windows add a distinctive touch — not to mention a little more natural light. It’s just one more element that makes this home a stand out in the North Naples community of Pelican Bay. ABOVE: The master bedroom does not disappoint with its eye-popping bed, metal-circled mirrors, and overhead, the drama of arteriors’ antique brass halo lined with clear acrylic cylinders of varying heights. A hand-knotted wool area rug anchors the space. ABOVE: In one of two complete baths for the master suite, Calusa Bay Design’s cabinetry lines the wall; garden views provide a picturesque backdrop for a freestanding tub by Kohler; and shells reef from Stoneline Group swirls across the floor with a pearly sheen. 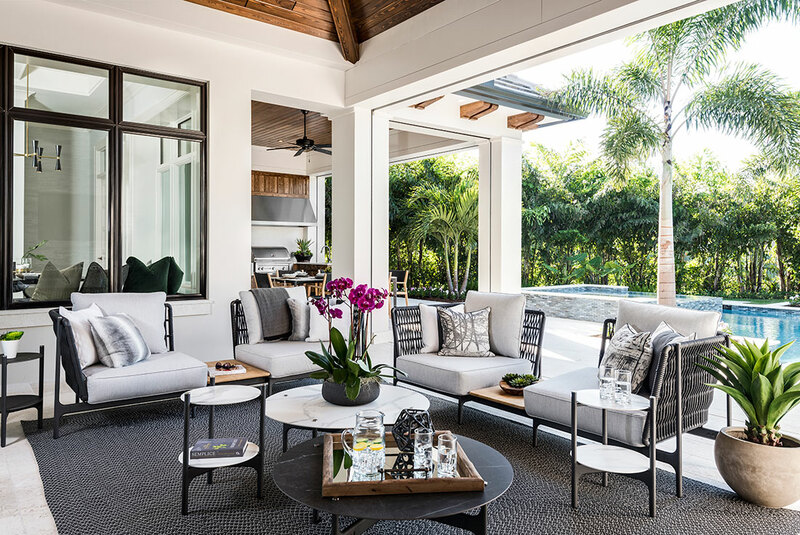 BELOW: Outdoor furnishings by gloster extend the home’s contemporary theme to the separate outdoor living and dining areas. The lighted 50-foot-long pool and spa sparkle beyond.